Hey everyone! I’m back again with another summer-themed post, seeing as I’m going to be jetting off on holiday in just under 2 weeks, so my brain is just constantly in summer mode, especially given the great weather we’ve been having! With that being said, I’ve decided to share with you some of my essentials for bringing on holiday with me in the summer. These obviously aren’t the bare essentials you need to bring with you, but just some of the things I make sure to bring every year, as they really help make my holiday even better. Disclaimer: items marked with * have been gifted to me for reviewing purposes. All opinions are 100% my own. Items in this post contain affiliate links. Obviously an essential to bring with you if you’re holidaying in a warm and sunny country is a pair of sunglasses. I thought I’d just include these ones because they’re probably my favourite sunnies I’ve ever had, as I love how they’re quite small, meaning they don’t take over my whole face and you can see my eyebrows above them. I don’t know why this is something I like, but to me, I just look so much better when my eyebrows aren’t covered by huge frames. I also adore reflective sunglasses at the minute, as I think they give such a cool look to your overall outfit, so these ones are perfect for me. I picked these up last year in Topshop but I’ve seen them in stores this year (although I can’t find them to link, sorry), so have a look in your local Topshop for these! Heat protectant mists for your hair are always an essential for me all year round, but they’re definitely something I ensure to bring on holiday with me. I wash my hair a lot more often on holiday than I would at home, so it’s super important that my hair is protected from the heat of the hairdryer, straighteners, curlers and all that. Heat protectant sprays or conditioning mists are also great to apply during the day, for example when your hair is damp after just coming out of the pool, as it can help to keep it smooth and soft, as well as protecting it from the sun. I’ve also heard it’s good to apply something like this before you go into the pool or sea, to protect your hair from the chlorine et cetera. 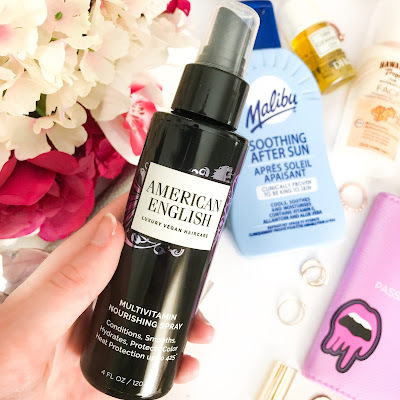 This *Multivitamin NourishingSpray from American English is my absolute favourite hear protectant, as it makes my hair sooo smooth and soft. I love a little spritz of perfume on a daily basis, but I’m not about to bring my huge, fragile bottles of Marc Jacobs with me in my suitcase (lol). For this reason, I’ve resorted to bringing little mini perfumes like rollerball ones or crayons. I’ve included in the above picture my favourites: a rollerball version of Soap and Glory’s Original Pink and Nicki Minaj’s Onika perfume, as well as a fragrance stick from Victoria’s Secret in ‘Tease’. These are easy to just pop in your suitcase and apply before you go out the door for the evening, and they won’t take up all that space in your suitcase. Setting spray is an essential for me all year round at home, but it’s particularly useful for me on holiday. I spritz a good load of this on at night after I’ve done my makeup, to ensure my makeup lasts all night in the humid air on holiday. My favourite is the Urban Decay All Nighter setting spray. We all know what it’s like to get sun burnt on holiday, especially if you’re the colour of a milk bottle like me, and burn super easily. This means that one of my absolute essentials to bring on holiday is After Sun. It helps soothe any painful burns and helps to fade your sunburn a lot quicker. It’s also great to just apply all over your body as a moisturiser after being in the sun all day, to keep your skin lovely and hydrated and to stop your sunburns peeling. 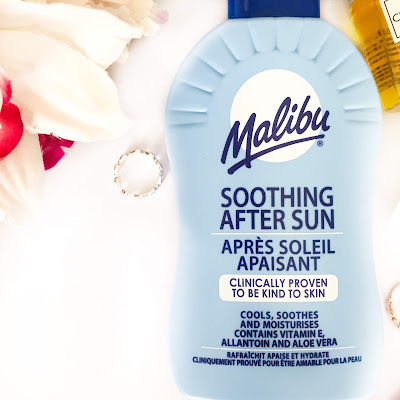 The one I’ve been using is this Soothing After Sun from Malibu which works really well. If you’ve been reading my latest skincare posts then you’ll know that I’ve been absolutely converted to cleansing oils to take off my makeup. They’re just so much more enjoyable to use than swiping a cotton pad with micellar water all over your face, and they make your skin feel so soft and cleansed. I think they’re great to bring on holiday because it means you don’t have to bring a ton of cotton pads or wipes with you. It also helps that they’re super moisturising, because when I’m on holiday I always notice I develop dry patches on my face, so this will hopefully prevent those. 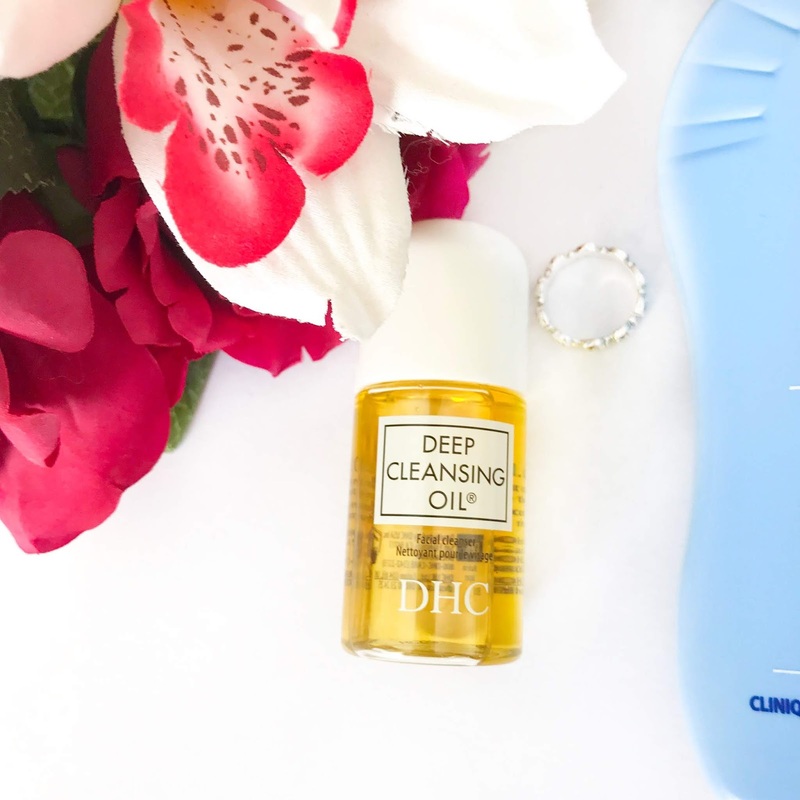 My fave cleansing oils are from DHC (you can read my review on this one here) and I would recommend them to anyone! This is a mini version of their Deep Cleansing Oil, which is not only adorable, but is perfect for travel. Sun cream is obviously an essential on holiday, but in this post I’m going to be talking about sun cream for your face. I hate the feeling of sun cream on my face, as it just feels so sticky, heavy and gloopy, and it really does not work well with my oily and acne-prone skin. Therefore, I always ensure to use a sun cream which is formulated for the face, as they’re a lot less sticky and are lighter. My fave is this Hawaiian Tropic Silk Hydration one, which is the perfect travel size and is so easy and quick to apply. It blends into my skin easily, leaving it feeling soft and fresh, but not sticky or oily. I’m going to finish off this post with a random little favourite of mine: this adorable passport cover. I actually got this free in Superdrug last year (I think?) and I absolutely love it. Passport covers are great to take travelling, as it means you can easily tell apart everyone’s passport if you carry them all together. And of course, it’s just stylish and adorable, so why not? 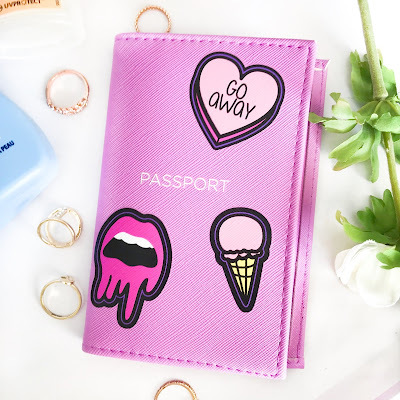 These are all my summer holiday essentials which just make life a little better on holiday and when travelling. What are your summer holiday essentials? I'd be tempted to say that you need more than just one pair of sunny! ahah! but they are an essential! also, sun screen! Love this post. 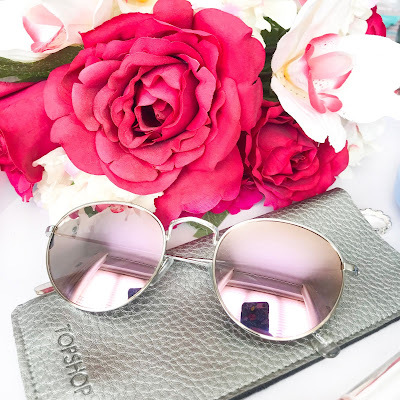 I think I take very similar products away with me, but like the above comment, I always take a few pairs of sunnies away with me! I like the idea of the small perfumes, it will come in really handy for hand luggage only trips! setting spray is a must!! i love that particular one cause it really holds my foundation in place. really don't wanna your foundation smearing all over the place, not cute!! Love them sunglasses! I really need to get a new pair, especially ones that fit nicely on the face because most of them look huuuge on my face haha. I'm hoping to go on holiday later this year so this is a great list. That passport cover is cute! I've never thought of getting one tbh, but would love to see what other styles are out there! I love buying things for my summer holidays! I'm a sucker for travel sized goodies like perfumes as well! This was a great post lovely, I can't wait to hear about your holiday! I love that passport cover! The graphics are so cute! Thanks for sharing all your holiday beauty essentials. I'm terrible at narrowing down what I need when I go overseas. Those sunnies are really nice! For some reason, I always forget my sunglasses when I go away! I always love a new pair of sunglasses! it is so important to keep your eyes protected from the sun's harmful rays and there's nothing better than a cute pair of sunnies. I didn't know there is a heat protectant mist! I need to go check that out! Mini perfumes are great - you don't need to dedicate to them and it's super portable! These are great year round, and ESPECIALLY for summer! 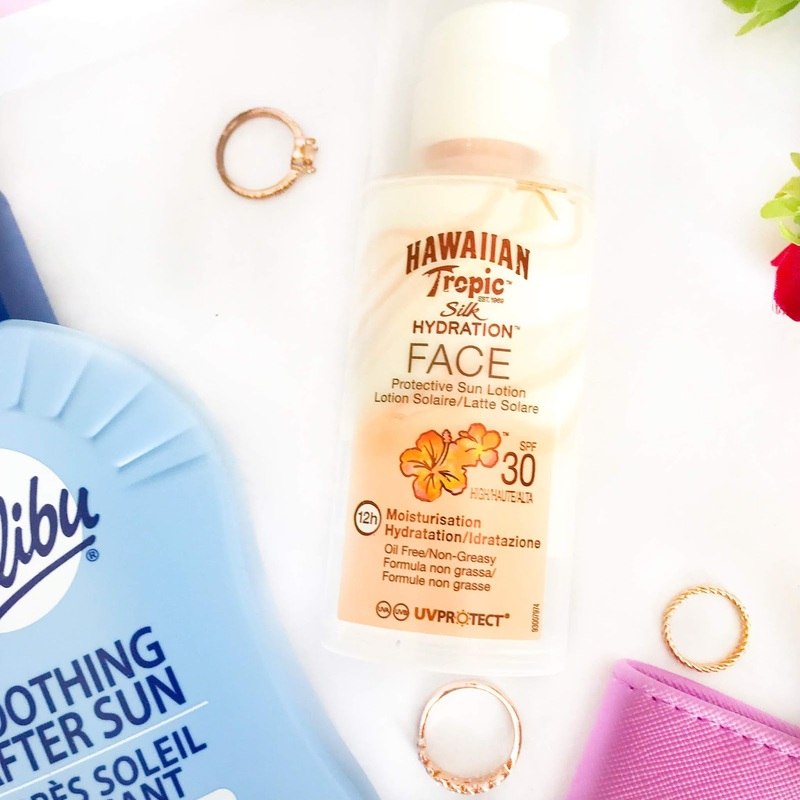 I use the Hawaiian face sunblock too and I love it! It's the only brand that feels good on my skin and doesn't clog pores! I've been searching for a heat protector For awhile, I'm going to check this out out! 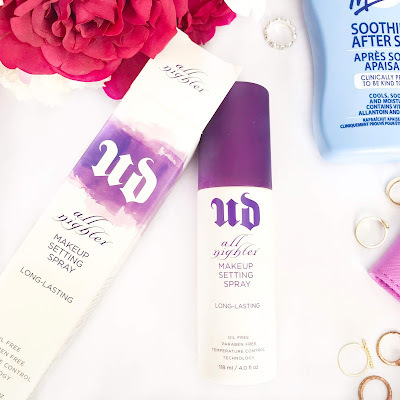 Also UD setting spray is Holy Grail status, use it daily. Love it!! I love that passport cover! I am super low maintenance, so the only thing on the list would be my sunglasses and I only have one pair because they're prescription - sad life. Lovely post and great ideas! I'm exactly the same as you, always pack After Sun before we've even travelled as no matter how much factor 50 I plaster on my milk bottle skin I still end up burnt by the end of day one! This was a great post, I've never thought of taking little mini perfumes with me so I'll definitely use that tip next time. My main holiday essential is a few books, there's nothing better than relaxing by the pool/on the beach with a good book! I need to get myself a new Passport cover too, I'd love a Disney one so I'm off to hunt for one now. Great post! Some great items in here to bring along on a summer trip for sure! I especially love little travel perfumes! All of these are 100% my essentials but aftersun is probably top of the list for me, even if im not burnt it's just so soothing!